Kelli and I needed to get away from this long winter and Kelli needed to use up some vacation days held over from last year. 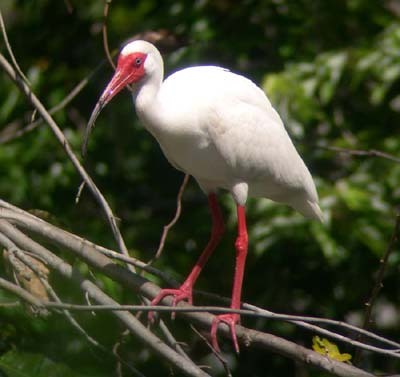 We decided on southwest Florida since she has never been to Ding Darling and Corkscrew Swamp refuges, well known birding locations. I had only been there once, about fifteen years ago. We kept our cost low which meant we had to get up at 3:30 am on Tuesday, March 10 for our 6:10 AM flight out of JFK on JetBlue. 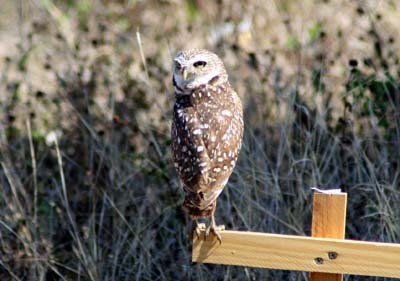 Our flight was on time and we headed to Cape Coral, home of many Burrowing Owls. 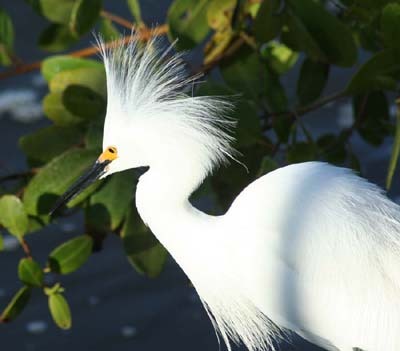 I had contacted the Caloosa Bird Club and was given some great birding information and some locations on where to look for them. They live in developed suburbia, in empty lots between homes. Our first stop was a success! 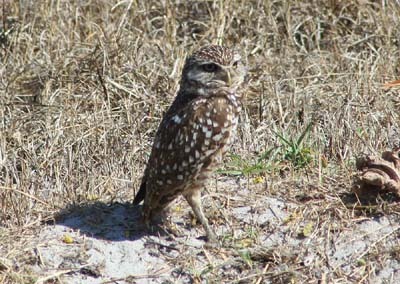 As we drove up two Burrowing Owls were out of their burrow. 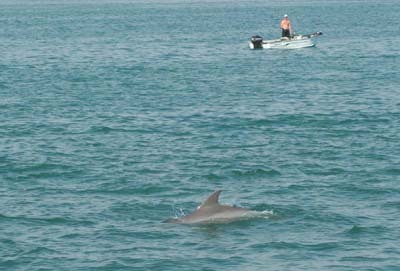 They were nearly oblivious to our presence. 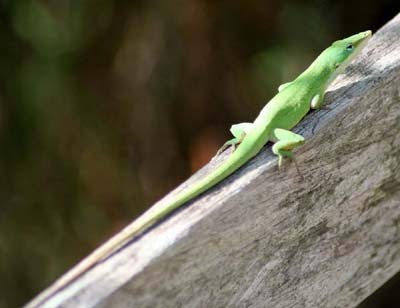 One even flew up and posed on a nearby perching post. 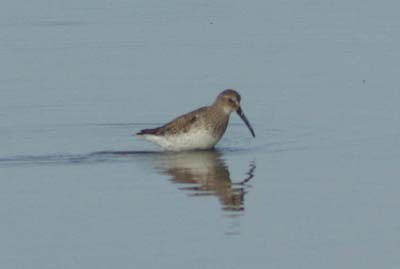 This was a lifer for Kelli ( a species of bird seen for the first time). After lunch at a nearby Perkins ( great food at a low cost) we checked in at the La Quinta Inn and Suites, 20091 Summerlin Road, Ft Myers. This turned out to be a great location. 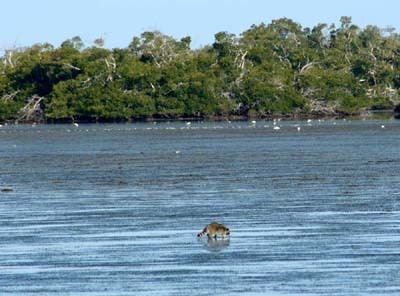 It's just off Sanibel Island and down the side road was Bunche Beach Preserve. They even provided free breakfast for guests. We relaxed and rested, this is a vacation of course. 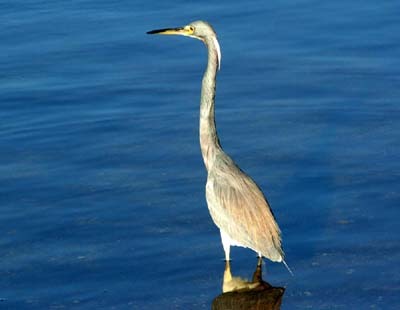 We were up early Wednesday for our complimentary breakfast and headed over the causeway to Sanibel Island. No traffic at this hour! We had timed the trip perfectly. 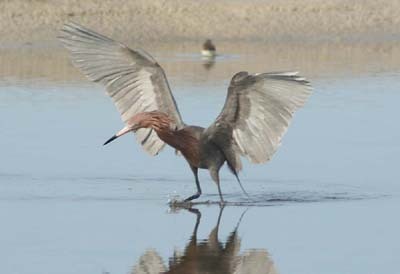 Early morning and a low tide at Ding Darling National Wildlife Refuge – perfect for birds. We headed out onto the wildlife drive. It was incredible! Birds everywhere and close by. 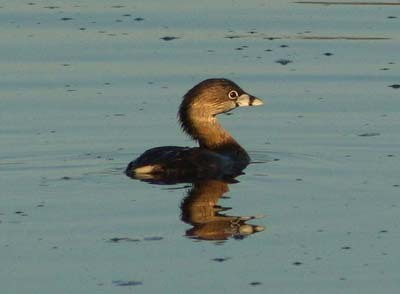 Pied-billed Grebes were quickly seen in small groups, diving underwater and chasing fish to eat. Then we hit one pond, near a culvert that had everything. It was a feeding frenzy in the shallow water. 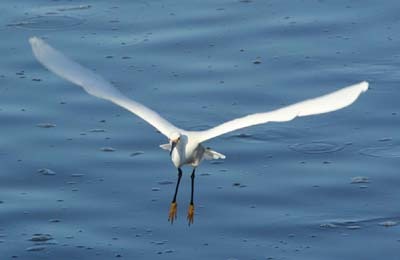 It was low tide and every bird in the area was here looking for easy and quick meals. Many birds ignored the humans with cameras nearby, they were hungry. 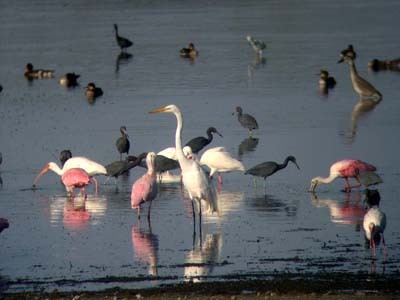 We had dozens and dozens of Snowy Egrets and White Ibis, many within a few feet of us. 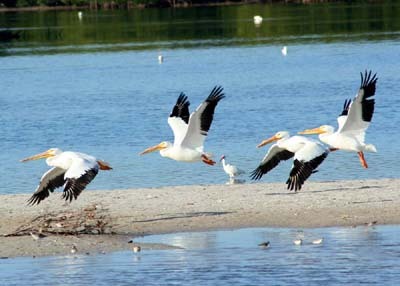 Twenty American White Pelicans patrolled the shallow waters for fish. 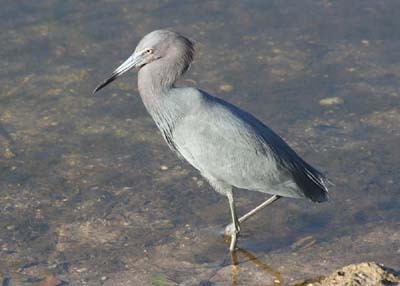 I counted two dozen of both Little Blue Herons and Tricolored Herons in the area. 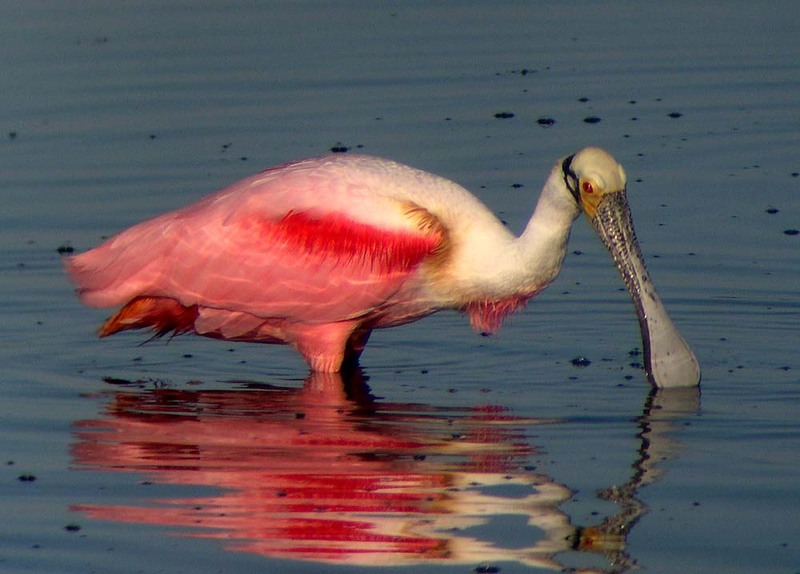 The most striking birds were the Roseate Spoonbills. 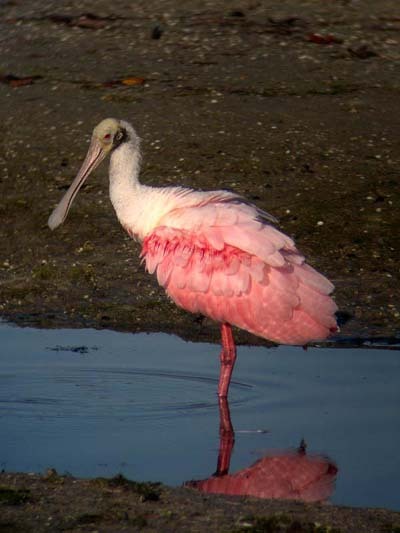 Their bright pink and red feathers, huge spoon shaped bill, black fake eye-ring on their heads made them a highlight for all those present. 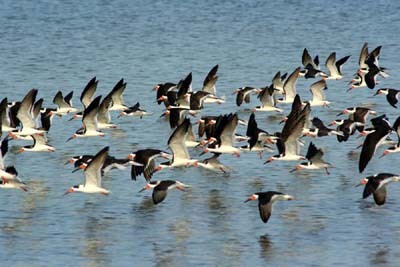 Many birds were flying back and forth, trying to replace a competitive bird for a better fishing spot on the shoreline. Kelli captured some great mid-flight shots. 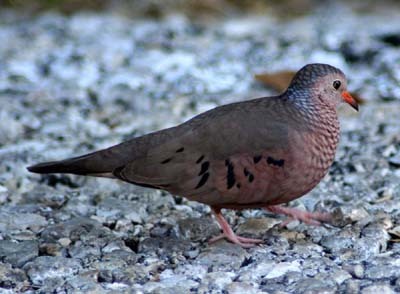 Further along the wildlife drive we spotted a Common Ground Dove. The trees held singing Prairie Warblers and Blue-gray Gnatcatchers. 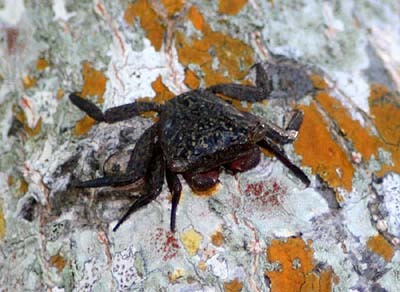 On a side trail boardwalk we found a couple of Mangrove Crabs in the Mangrove Trees. 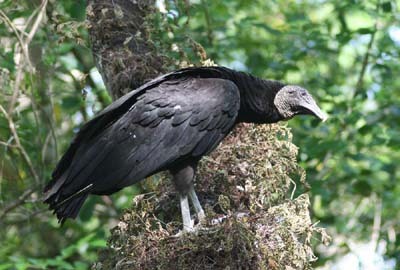 They spend much of their time in the trees. At the end of the boardwalk we found another Raccoon searching the flats for a meal. 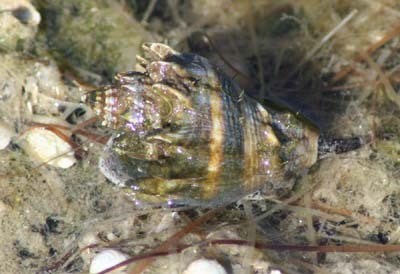 Later, along the shore of the cross dike both Florida Fighting Conchs and Florida Crowned Conchs were seen in the shallows. 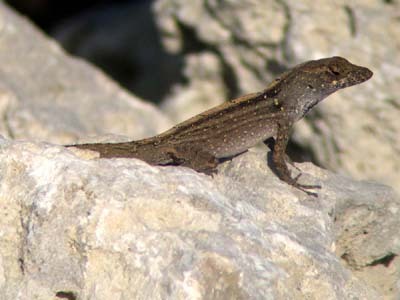 Back at the center we explored a side trail and found some cooperative Brown Anoles. 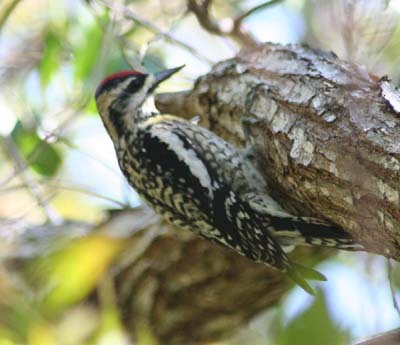 We unexpectedly found a Yellow-bellied Sapsucker on a trunk above us. We find this woodpecker in the Adirondacks where it’s a common breeder -seeing it on a tropical island in shorts and 85 degree weather seemed inappropriate. Lunch was at the Island Cow. We highly recommend it. We had an unusual lunch of Frickles (fried pickles), Oysters, Chocolate Egg Cream and fried alligator. The Cow Potion (a cherry coke float with vanilla ice cream) was great too. We shopped along some of the small shops on Periwinkle Way where I found White Peacock, Cloudless Sulphur, and Mangrove Skipper in the butterfly gardens. 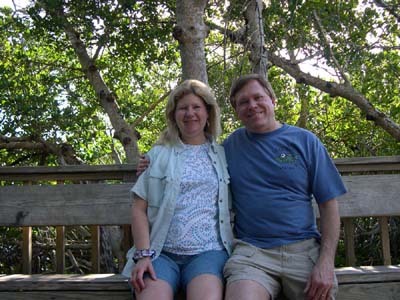 We made our way over to Sanibel Lighthouse and fishing pier. 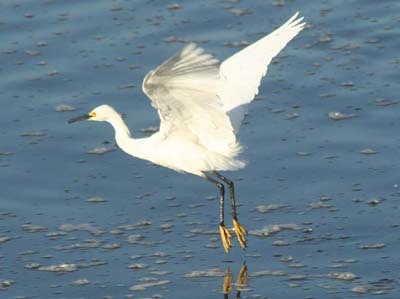 More Snowy and Great Egrets were found along with a few Royal Terns and Laughing Gulls. 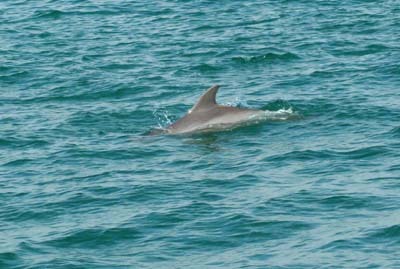 A Bottle-nosed Dolphin was found off the fishing pier. 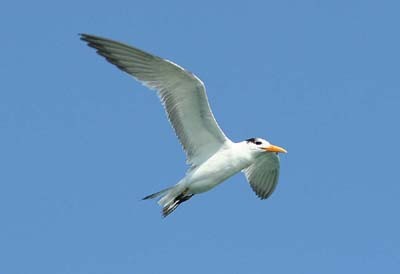 A few Forster's and Sandwich Terns flew by. Later that evening we relaxed by the pool. 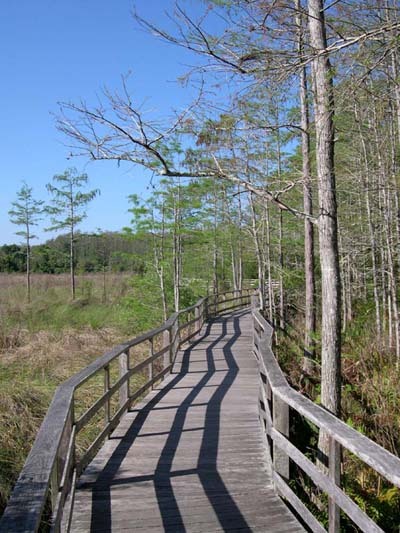 Thursday, March 12, 2009 - We headed out early to Corkscrew Swamp near Immokalee, Florida. 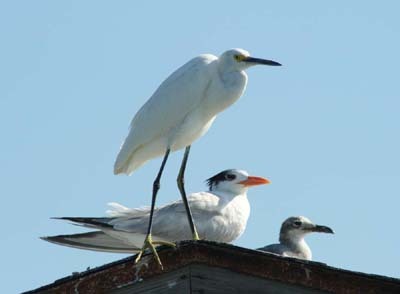 Cattle Egrets were found in fields along the way and a Sandhill Crane passed overhead. 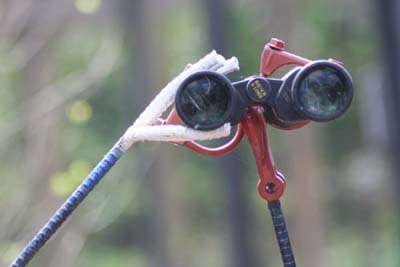 After an hour drive we were greeted by Great Crested Flycatchers in the parking lot and an Ovenbird in the garden near a whimsical Binocular Man statue. We paid the entrance fee and started the 2.4 mile boardwalk. 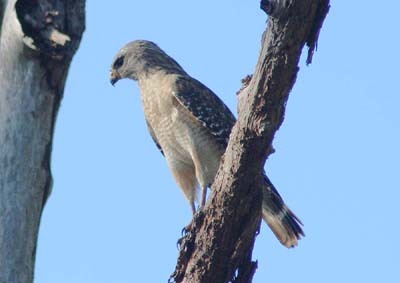 A Red-shouldered Hawk flew in and perched right above us. 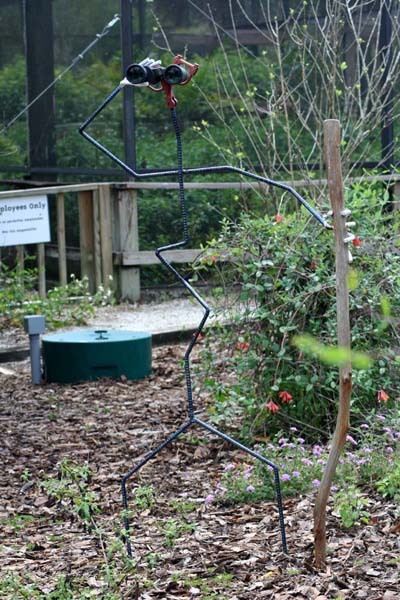 A side trail led to some feeders where we were delighted by two male Painted Buntings. 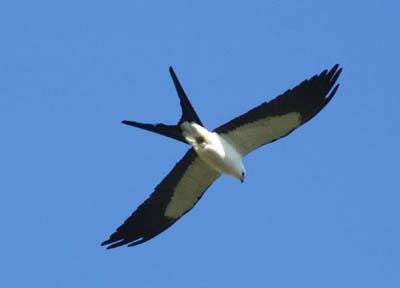 Overhead we had our first Swallow-tailed Kite. 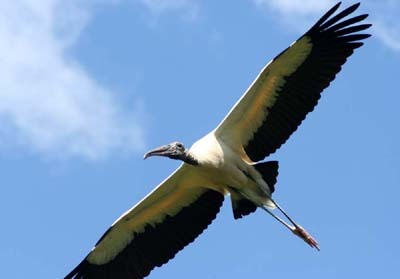 Before long we had five circling above us at one time. 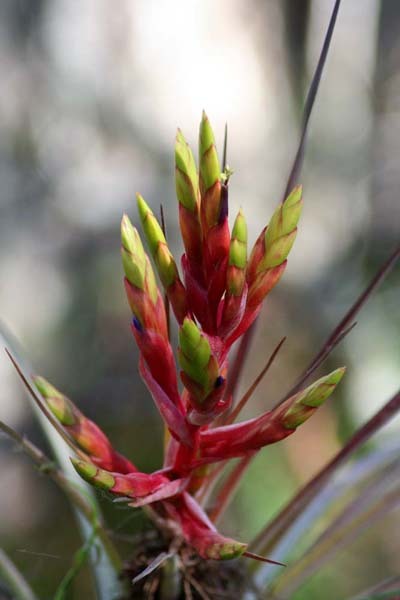 The first part of the board walk is in the dryer section and we enjoyed many huge air plants, some flowering; our first Green Anole of the trip; and a Ruddy Daggerwing (a butterfly) zipping by. 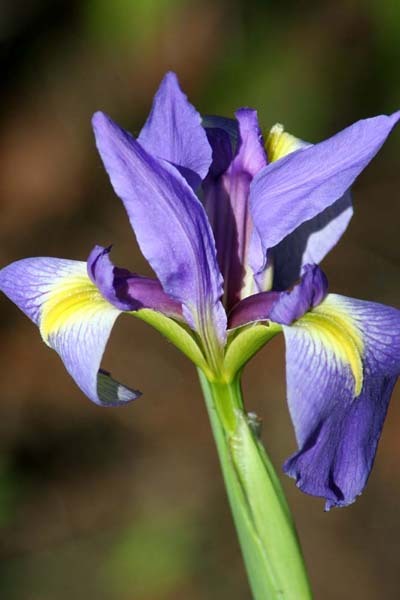 We ran into a Corkscrew volunteer giving his cousin from Connecticut a tour and he kindly pointed out interesting plants such as Dixie (Prairie) Iris, Resurrection Fern, Spotted Water Hemlock (very poisonous) and a very rare ghost orchid (not in bloom). 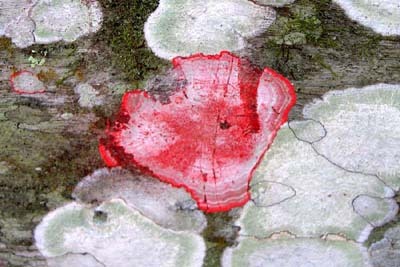 Bubblegum Lichen was found growing on the sides of the boardwalk and gets its name from its red-pink color. 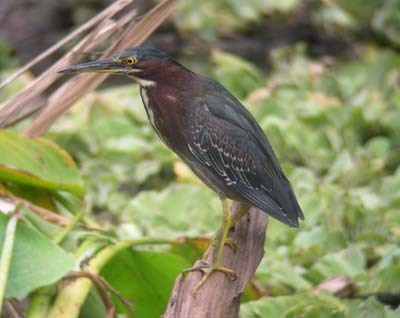 Northern Parulas were heard singing and we eventually got a look at one. Other warblers included Black-and-white, Yellow-rumped, Common Yellowthroat, Pine and Palms. 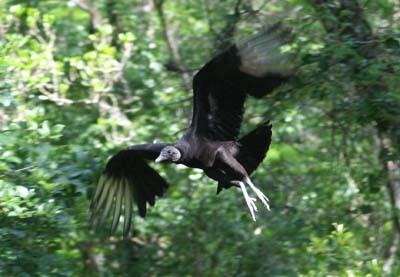 A Black Vulture was flying in and out of the trees over the boardwalk and Kelli got some great pictures. 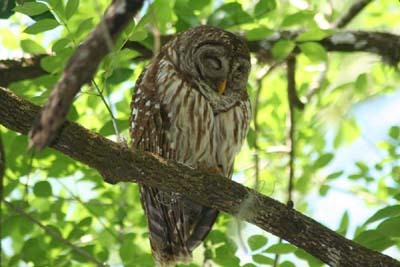 Another volunteer pointed out a sleeping Barred Owl only 20 feet above the boardwalk. 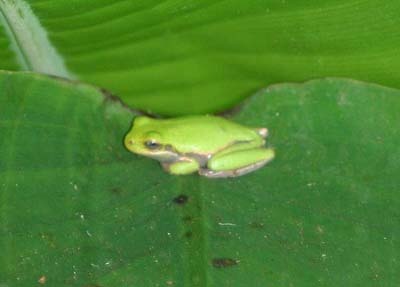 A small green tree frog was found hiding between two large leaves. 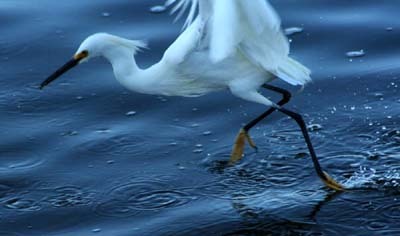 We headed into the wetter areas and had just about every long-legged wader imaginable. 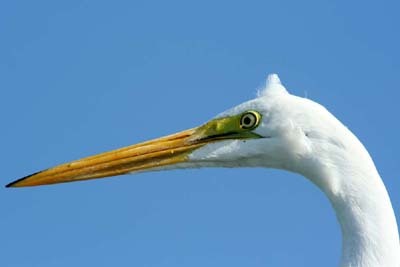 There were White Ibis, Green, Great Blue, Tricolored and Little Blue Herons; Snowy and Great Egrets, and both Black and Yellow Crowned Night-herons. 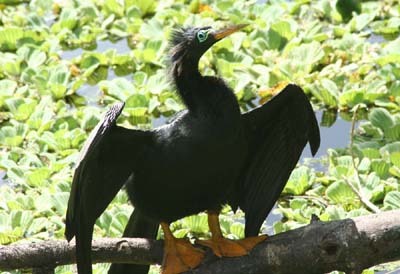 Anhinga, some with their glowing green eye rings, were boisterous, loud and chasing each other - it must be near breeding season for them. 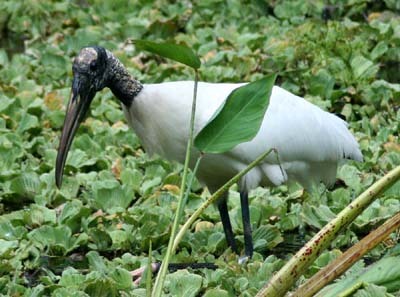 Wood Storks slowly worked the swamp right next to the boardwalk looking for tasty morsels. 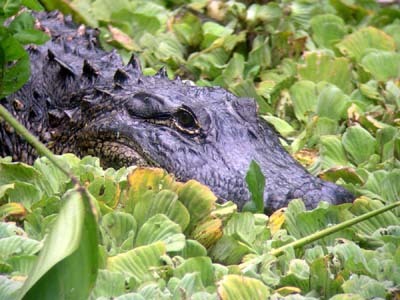 A few alligators, some 10 feet long shared the swamp with the wary birds. Pileated Woodpecker and Carolina Chickadee rounded out the list as we exited the board walk. We visited the center and its store, and then headed back for lunch. We found a Bob Evans along the way. 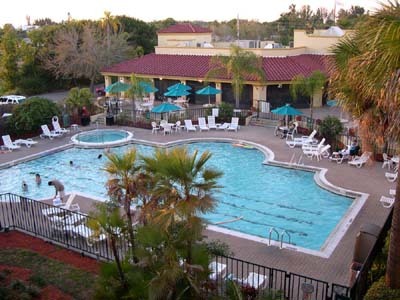 Back at the motel we relaxed in the whirlpool and enjoyed frozen Pina Coladas and Bahama Mamas. Our fourth day was a more restful day. We headed down the John Morris Road to Bunche Beach. 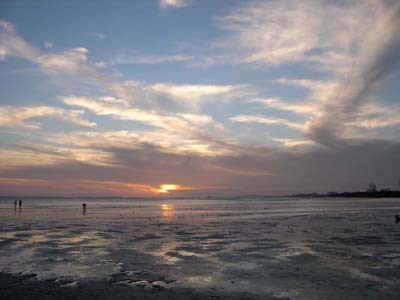 The air was cool and it was low tide. 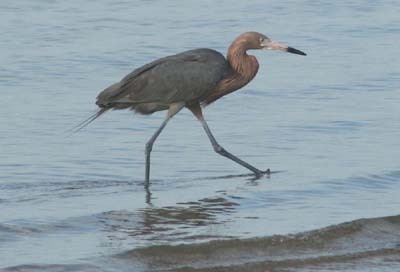 Our first bird was a Reddish Egret, dancing around the shallows chasing fish. 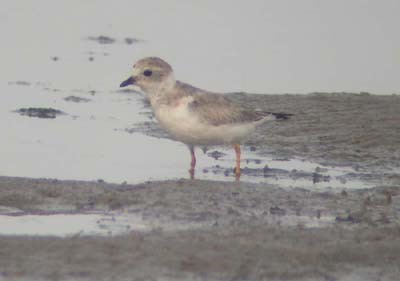 We birded the exposed sand flats and found Wilson’s Plover and a couple of Piping Plover, one with a flag and three leg bands on it. 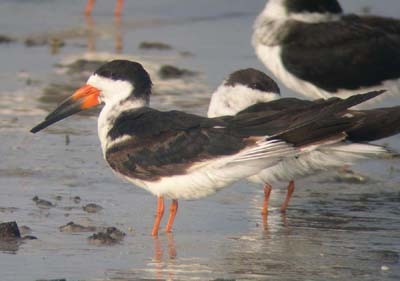 A thousand Black Skimmers were there and when a Bald Eagle came in all the birds took off. 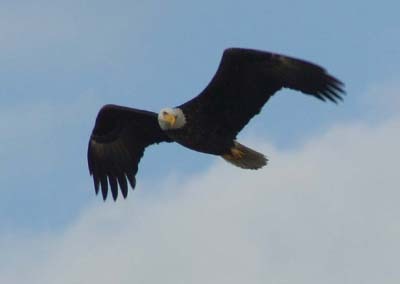 The eagle landed on the sand bar, but eventually took off and many of the birds returned. The tide was coming in and it was getting warmer. 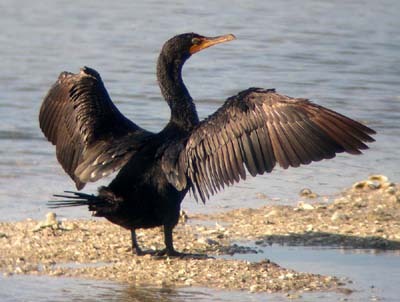 We went back to our car to drop off the birding gear for our beach towels. At the car we were surprised in finding a Yellow-throated Warbler. We relaxed on the beach and worked on our tan. The evening was spent by the pool once again. 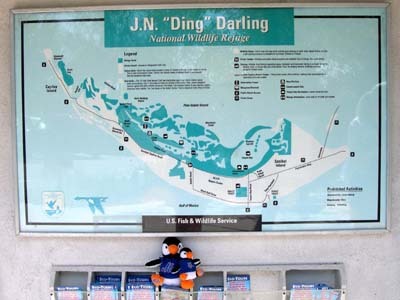 On our last full day we decided on visiting Ding Darling again. We were at the wildlife drive at opening (7:30 AM) along with about 20 other cars. 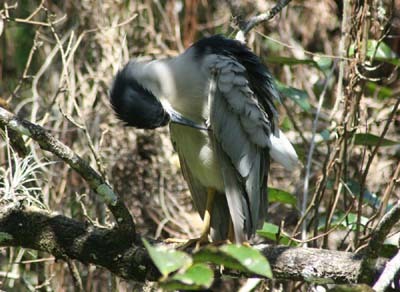 We first bypassed many of the pools of water to try to listen and find a Mangrove Cuckoo further down. 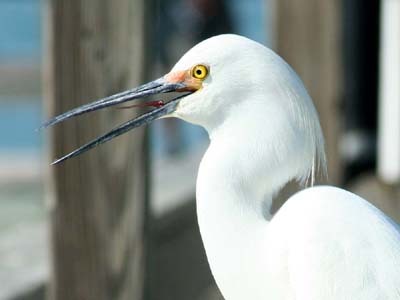 We were unsuccessful but were amused by a White Ibis swallowing a one and a half foot long snake it caught. 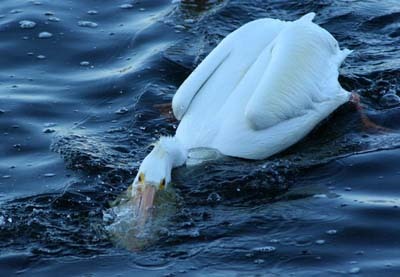 We drove around again to find many of the birds seen Wednesday but not quite so close. 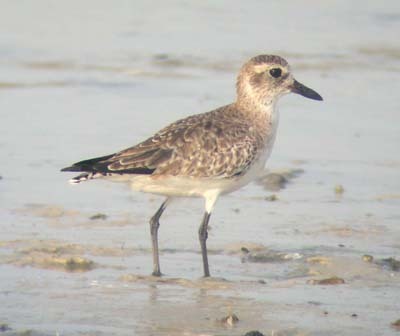 New species for the trip included Red Knot, Short-billed Dowitcher, Mallard and Belted Kingfisher. 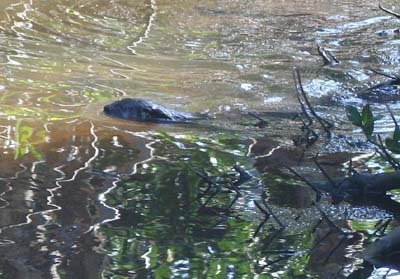 A highlight was finding a River Otter working its way east along the water next to the drive. We visited Bowman’s Beach and did some shell collecting. 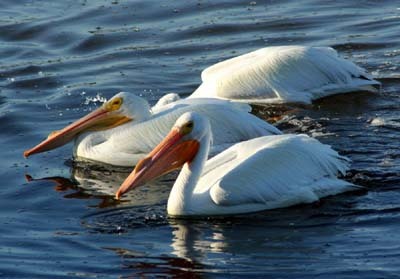 We saw a few Brown Pelicans and Royal Tern. A Pileated Woodpecker flew over us as we walked back to the car.